Get the right type of furnace to cut back on the need for heating repair Spring Texas. The chosen type of home heating system affects its overall lifespan. If it is not suitable for a particular home or region, the system does not last long. The Spring, Texas weather features humid and hot summers. The winter weather is mild and does not last long. The split heating and cooling systems serve homes in this region well. One heating aspects most homeowners get wrong is the furnace selection process. Sometimes, you move into a new home and do not realize that you have a flawed system due to the heater type. It could be that the furnace does not serve your home well because it works better in smaller homes. Troubleshooting these issues starts with understanding the different types of HVAC systems available. Furnace repairs and maintenance is easier with a better understanding of your system. In that equation, you need a reliable company to call up for those unexpected breakdowns. Houston Admiral delivers 24-hour dependable furnace repair services. Call them on the phone at 281-876-9400. Visit https://goadmiral.com for more about their ductwork repair services. Any home with a heating system more than often has a split HVAC system. These heating systems make use of components situated both outside and inside houses. The components operate collaboratively. The collective aim is ensuring your home receives ideal temperatures all year round. The split system features an air conditioner to cool the refrigerant and a furnace. The systems also feature a fan, a thermostat, and air ducts. Some of these systems feature humidifiers and purifiers. The Spring, Texas humid weather may cause the need for dehumidifiers. The split heaters provide by far the most diverse range of options. The systems are available in affordable options. Affordability is important for homes looking to upgrade to newer heating systems. Split furnaces accommodate modifications with minor or no changes needed. The split heaters require ducting systems. The split systems are impractical where duct systems are expensive to install. Find out the precise heater you need to avoid system failures. A good company for furnace repair in Spring, TX can help with this. Houston Admiral is the company you want handling your heating system. Reach them on the phone at 281-876-9400. Visit https://goadmiral.com for more about their heating installation services. More homes constructed in recent times feature the hybrid HVAC systems. These heating systems work much like the traditional split systems. The main difference is that these systems come in electric and heat pump fueling options. The heat pump cools and heats the refrigerant as needed. The split hybrid system also features a furnace, a thermostat, and air ducts. The primary benefit the system offers is increasing operational efficiency. The ability to switch between fueling options with these systems is also as an advantage. The high price of the systems prevents many homeowners from buying it. Some homes cannot accommodate the ducting systems most conventional heating systems use. These homes make use of the ductless heating systems. The systems provide homes with the desired internal temperatures. Ductless HVAC systems vary in size, and they feature a thermostat, fan and heat pump. The difference with these systems is that they use tubing and wiring. The wiring connects the outdoor unit to the refrigerant. These systems work best for offices or homes without ducting systems. The system supports zoned climate control. One outdoor unit serves up to four indoor units each with its individual thermostat. The ductless systems do not come with a standard efficiency level. They do not work best in areas with colder climates. Ductless heating systems do not provide the range of options the split systems offer. Such systems can breakdown requiring the services of heating repair in Spring, TX. 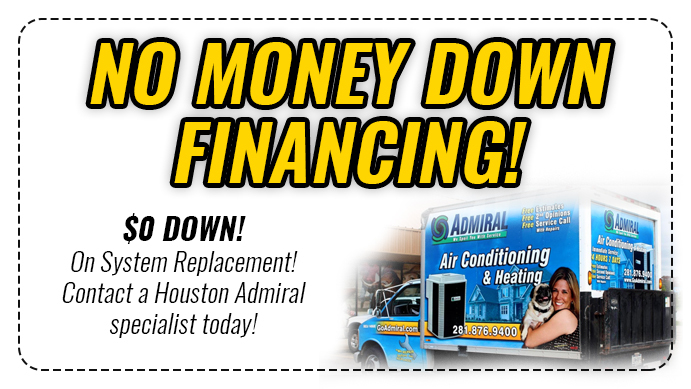 The company you want to fix your ductless heating system is Houston Admiral. 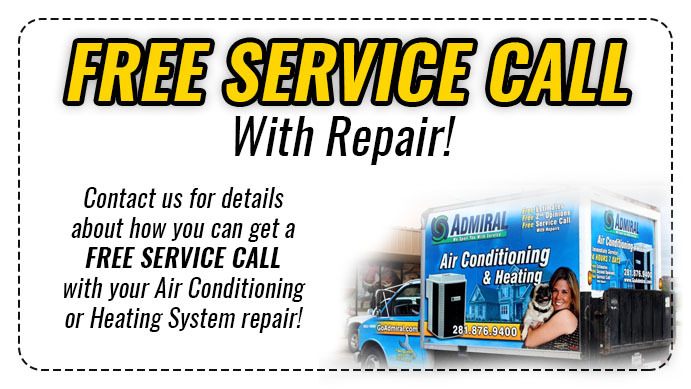 Give them a call at 281-876-9400 or visit https://goadmiral.com. Some homes are much smaller and cannot accommodate all the parts of a split HVAC system. The packed type of heating and air systems work best in such homes. These systems feature heating and cooling components packaged in one unit. The unit comes with a heat pump/air conditioner, thermostat, fan, and evaporator. You need the services of heating contractors in Spring, TX. From installation services to repair and maintenance services; every homeowner calls furnace experts. Knowing your heater type helps to call the right contractor. The outside placement of the systems mechanical parts makes it operate silently. The efficiency level of these heating systems compared to the rest is much lower. The outside placement of the mechanical parts subjects them to quick wear and tear. Get The Right Type of Furnace Contractor for Heating Repair Spring Texas. Regardless of the kind of heating system you have, heaters give in and need maintenance. Knowing the kind of system you have does help in getting the right contractor for the job. Most heating engineers focus on handling particular furnace models. You want to make sure that the heating systems company can work on your particular system. Call Houston Admiral to handle all your heating system installation and repair needs. The company specializes in RUUD systems and delivers 24-hour repair services. Get them on the phone at 281-876-9400. Visit https://goadmiral.com for more information about their furnace repair services. Houston Admiral is the right contractor for heating repair Spring Texas. Spring, TX has hot and humid summer weather and mild winters. The 30’s depression had a great negative impact on Spring. The trend continued up until the 60’s during the oil boom. It saw a boost in the Spring economic growth and a steady rise in businesses. Old Town Spring is a favorite shopping hub. Visitors can enjoy a variety of restaurants, galleries, antiques, and wineries. Visit the city of Spring TX online at https://www.springtx.com/.